Pictured outside the west church, Gladys had twisted her ankle shortly before. The occasion was Gladys's daughter, Serena's wedding. Thank you for the compliment Secret Admirer. 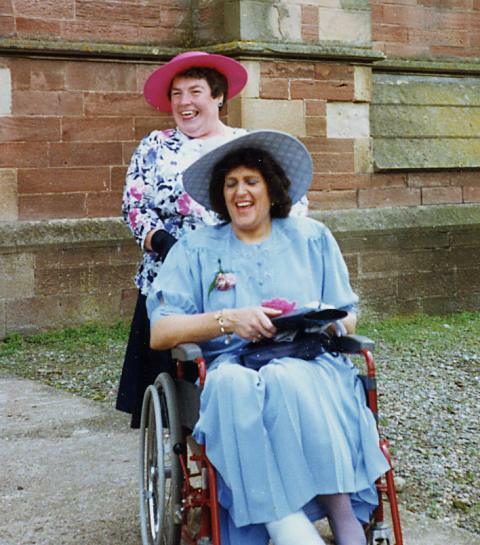 I would like to say I had surgery on my right ankle to repair old sport injuries - I was in plaster for months but it didn't stop me dancing in the wheelchair with Alison's son James at my daugter's wedding in the National Hotel, Dingwall. You still look very glam Gladys - remember me?